The food system today is not the one previous generations were used to. Genetic engineering and the agrochemical complex have “changed the way our food is produced, distributed and marketed, and, in many cases, not for the better” according to Greenpeace. For instance, the use of pesticides currently not only pollutes streams and wells and kills fish and birds, but also causes cancer, given that the toxic chemicals often remain as residues in many vegetables and fruit. Fortunately, innovative food activists like Josephine Chu are coming up with solutions to challenge and counter the direction in which the food system is heading. 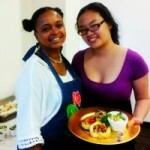 In May 2012, Josephine co-founded Zenful Bites with Yolanda Hawthorne, a social enterprise in Washington DC, which uses food as a medium to transform people’s lives, by creating a sustainable, healthy and just food system through education and eco-catering. Josephine met co-founder Yolanda Hawthorne while teaching her daughter in elementary school. 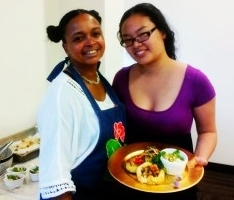 Yolanda’s passion for cooking healthy food and Josephine’s interest in creating a sustainable business that promotes healthy food in the community were a perfect match. For Josephine, schools and universities, which are responsible for teaching the future generations, play a key part in creating a new food system in DC. For this reason, Zenful Bites sees education as a key component of its work. This entails supporting more community gardens and urban agriculture projects as well as rendering people more knowledgeable of the food system “from seed to plate.” Josephine envisions a system where everyone would have access to fresh food, the means to buy it, awareness of its origins and how to prepare it. Although a young company, Zenful Bites has already managed to cater to a diverse clientele, including universities, non-profits, and labor unions. Some of these clients include American University for its U.S. Farm Bill Symposium, nonprofits such as Physicians’ Committee for Responsible Medicine, Beyond Pesticides, Farmworker Justice, DC Co-op Day, and Diverse City Fund, and labor unions such as Unite Here for its Real Food, Real Jobs campaign. Zenful Bites specializes on providing health-supportive cuisine and tailoring its offerings to meet a variety of dietary restrictions including: vegan, raw and gluten-free. As an increasing number of people are realizing how broken the food system is and are looking for healthy and local alternatives, Zenful Bites hopes to fulfill that need. In order to do this, Zenful Bites directly engages with local farmers and cultivates relationships with those using sustainable and organic farming practices that respects the environment, as opposed to the polluting and damaging techniques of big industrial farms. Josephine and her partner Yolanda Hawthorne have visited many of the farms that they source from to see the farmers and learn how they grow their food. Josephine is proud of what her company has managed to achieve within the span of a year given limited resources. She is also proud of the in-kind donations that Zenful Bites has provided to organizations such as to DC Environmental Film Festival, DC Fair Food in support of the Coalition of Immokalee Workers, Benevolent Media’s Loving Market in support of DC-based non-profits, and the Conference on Asian Pacific American Leadership. While for now, Zenful Bites’ revenue varies from month to month depending on clientele, one of the company’s objectives is to cultivate institutional buyers to generate stability. They are working with others to open up a worker-owned food co-op, which in addition to serving healthy to-go prepared items, would serve as an educational center for food and justice issues in DC. She hopes the food co-op can serve as a catalyst to spur further projects that would contribute to establishing a healthy urban food system. Find out more about Zenful Bites on their website: http://zenfulbites.com or on Facebook, Twitter, Pinterest, or Instagram.